Salt is so common, so easy to obtain, and so inexpensive that we have forgotten that from the beginning of civilization until about 100 years ago, salt was one of the most sought-after commodities in human history. What’s in your refrigerator? Even if some people only use it for storing a bottle of ketchup, left-over pizza, and a six-pack of diet Coke, there is a fridge in practically every American home. Check your pantry: what canned goods are there? Chef-Boyardee, anyone? 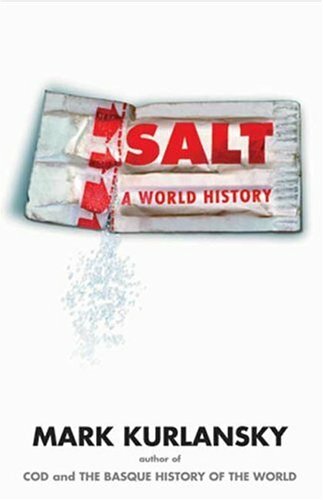 In Salt: A World History, Mark Kurlansky (New York: Walker) reminds us of the profound impact of these two inventions on our foodways. Before refrigeration and canning became so common as to be invisible, salting was — along with smoking and pickling — among the most common methods of preserving perishable food in most parts of the world. Salt was so valuable that Ancient Romans sometimes paid their soldiers in salt. The origin of the word salary is sal, or salt in Latin, and the expressions to be “worth his salt” and to “earn his salt” came out of this practice. Sweeping through swaths of world history, Kurlansky details beliefs, production, trade, government policies, military strategy, scientific discoveries, and technological innovations demonstrating salt’s crucial role in human endeavors. The transformation of communities into civilizations depended on their ability to first extend and stabilize their food supply. Civilizations from the Incas to Asian India were founded not only by rivers, but also near places with access to salt. Salt became economically important as communities expanded: though salt, which is relatively bulky, was usually not exported on its own, it was used to preserve food that was then profitably sold. Wars were won or lost depending on an army’s access to salt to make and preserve food, for medicine, and to maintain livestock or horses for cavalry or hauling supplies. In example after example, Kurlansky illustrates how salted foods shaped economies for four millennia, and with economies, also government policies. Even as recently as 1930, Mohandas Gandhi sparked the independence movement in India against British rule by leading a campaign to deliberately break the laws prohibiting local harvesting of salt. Salts have been used for much more than preserving food. While most of Salt focuses on the use of food salt, Kurlansky touches on the uses of non-food salts. He writes that by the Middle Ages, salts were used to cure leather, clean chimneys, soldering pipes, glazing pottery, and as medicine. Since the start of the Industrial Revolution, the use of salt for food has become less significant compared to its uses for industrial purposes. Kurlansky shows the direct connection from scientific research conducted on salts to new industries. He even connects the inception of the oil and gas industry with salt mining: much of the drilling technology was the same, and oil, gas, or both are frequently found on the edge of salt. Even unused salt mines have found contemporary usage as storage for nuclear waste and emergency oil reserves. Nowadays, the US is the largest producer and consumer of salt, but only 8% is for food, and 51% is for deicing roads, and the remainder is for industrial purposes. Lest it gets too geeky, Kurlansky seasons the text liberally with historical recipes and instructions for salt-cured foods, from the ancient Roman fish sauce, garum, to artisanal soy sauce crafted by modern-day entrepreneurs in Sichuan, China. The book is a fascinating review of history through a crystalline lens. I particularly enjoyed Kurlansky’s discussion of salt’s symbolic value: emerging from its ability to preserve and sustain life, Jews, Muslims, and Christians all believed that salt protected infants from evil, but so did disparate peoples from Japan to Haiti. Long linked to fertility in ancient societies from Egypt to Borneo to North American Indians, salt was also thought to cause sexual arousal or to spur reproduction. It’s trendy now to write history from “below,” exploring the perspectives and experiences of regular people, instead of the leaders and the generals. This book accomplishes a similar feat with that workhorse, salt. Salt doesn’t have the gleam and glamour like the quest for gold and territorial conquest, but without it, how would the world’s civilizations have functioned? Would a different method of animal domestication have been found? And what would food preservation have entailed? Would we wonder how to walk like an Egyptian? Would all roads have led to Rome? Would the sun have risen over a British Empire? You’ll never see our most common seasoning the same way again after reading Mark Kurlansky’s Salt. This entry was posted in Recommended on September 24, 2013 by sandra.